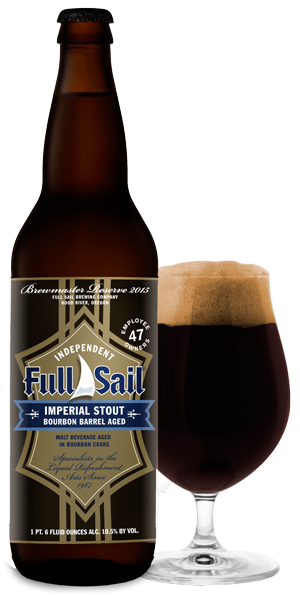 Full Sail Brewing has announced the release of their 2015 Bourbon Barrel Aged Imperial Stout. “The annual release of our barrel aged beers is a celebration of the best of American beer and American bourbon. Barrel aging beers has been a Full Sail tradition since 1998 when we joyfully discovered what happens when you pair vintage barrels, dedication, and patience. 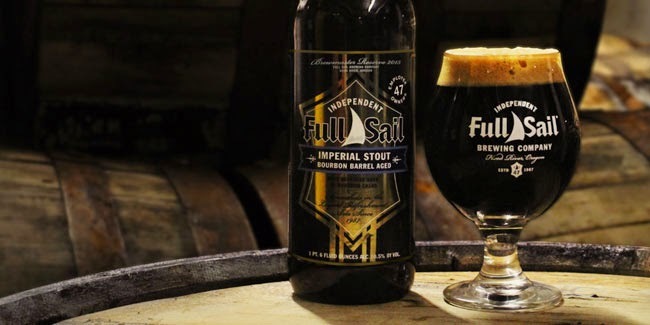 Every year since, we’ve brewed an imperial style dark ale, filled roughly sixty oak bourbon barrel casks, and then aged them in our cellar for a year,” said Jamie Emmerson, Full Sail Brewing Company’s Executive Brewmaster. This year’s Bourbon Barrel Aged Stout is inky black with aroma of dried cherry, shaved chocolate, and whiskey. It has a full malty palate with flavors of dark chocolate, vanilla, cherry, dried figs and a subtle hint of molasses. It finishes deliciously warm on the palate. Brewed in December of 2013, the beer was carefully aged for a year in Kentucky Bourbon casks from Jim Beam and Four Roses. This extended aging allows the Stout to pick up the flavors of the wood, bourbon and oak. The aging accentuates the robust character of the Imperial Stout and brings out the depth of flavor from the bourbon creating an overall elegantly sophisticated beer. To celebrate the release of this beer, Full Sail is planning two Horizontal Tasting events that highlight the individual bourbons. “Bourbon Barrel Aged Imperial Stout is a blend of the two barrel varieties, Jim Bean and Four Roses, so we thought it would be interesting to try a bit of each before blending. We kegged off a very small stash of each variety for the release. Join us to celebrate the release and taste the differences between the two individual bourbons and the final blend,” added Jamie Emmerson. The special tapping events will take place at 5 p.m., Thursday, February 5th, at Full Sail’s Brew Pub in Hood River, and in The Pilsner Room at Harborside at the Marina in Portland, Oregon on Tuesday, February 10th at 6 p.m. For more information call the Full Sail Brew Pub at 541-386-2247 or the Harborside at 503-220-1865.